To fully experience the way of life at Chichi, start by meeting your guide at your hotel for the pleasant ride around winding mountain roads until you reach the market town, which is perched at altitude of 1,965 metres (6,447 feet) above sea level in Guatemala’s rugged Western Highlands. After hotel check-in at Chichi, follow your guide into the cavernous market for a peek at its increasingly busy loading areas. Families arrive from outlying villages aboard trucks and carts loaded with products from their farms and workshops. They stock their stalls with a dizzying assortment of merchandise while the family leader strikes deals with the vendors who will sell their goods. 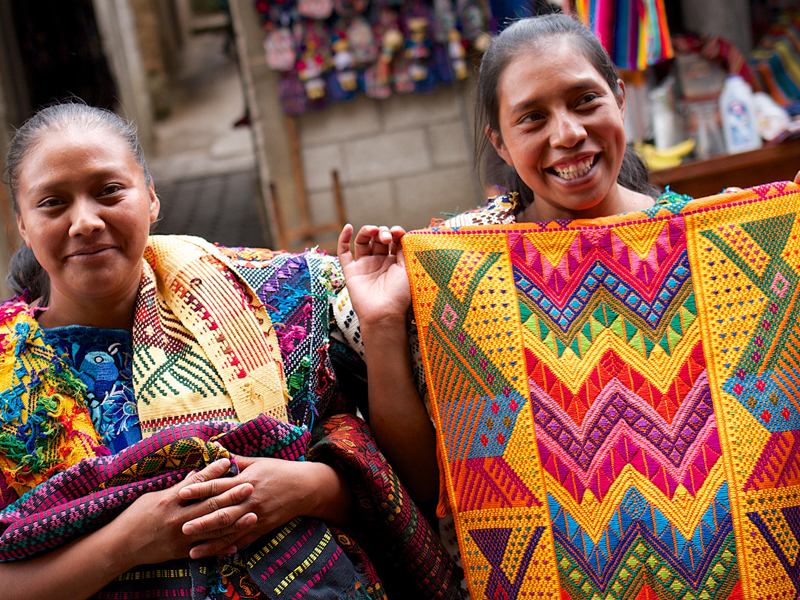 Afterward, explore nearby streets to witness the daily routines of Chichi residents, noting the traditional clothing (traje) worn by many of the locals. In the evening, a family working to preserve the community’s indigenous traditions welcomes you into their home for a fascinating evening of food and culture. Children wearing colourful costumes and wooden masks perform a traditional dance (Baile de los Moros), portraying Conquistadors and the Maya they encountered. Share a traditional dinner with the family, sampling potent cusha (Maya moonshine) if you dare. In the morning, return to the increasingly frenzied market to experience it in full swing! You’ll see piles of brightly hued textiles skillfully woven into blouses, skirts, rugs, blankets, tablecloths, purses, and much more. 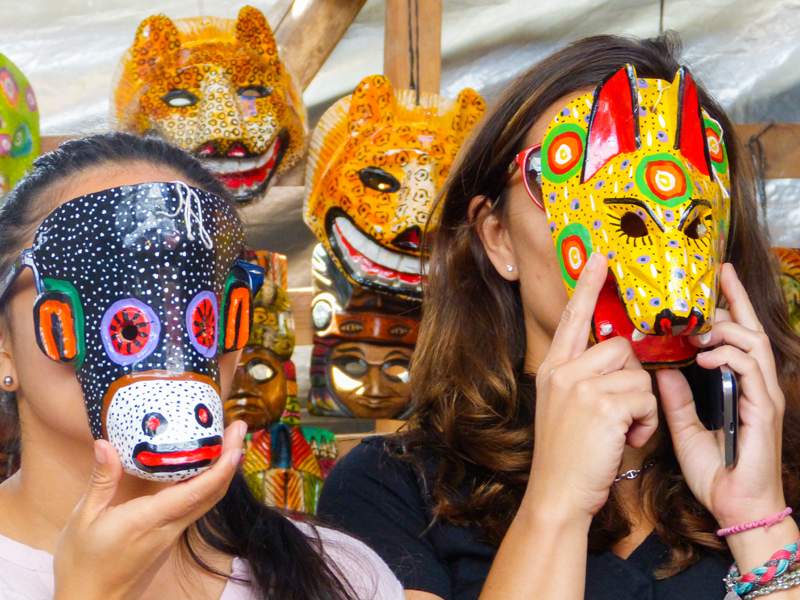 Traditional wooden masks depict deer, dogs, jaguars, rabbits, and other characters featured in traditional dances, like the one performed for you at the family home. Rustic ceramics include delicate butterflies, miniature village scenes, and brightly painted kitchenware. Mounds of vegetables seem to glow in vivid shades of red, yellow, green, orange, and purple. Step into a real-time, Diego Rivera scene amongst rows and rows of fresh flowers and their eager vendors. Witness animated bargaining, conducted mostly in the K’iche’ language, as locals and shoppers from nearby villages stock up on household goods and farm supplies. Their shopping lists include vegetables, herbs, seeds, machetes, and livestock, such as chickens, turkeys, pigs, and goats. Following your before-and-after market adventure, stroll to the nearby Santo Tomás Church, where Maya and Catholic rituals mingle. Hike up the hill to the Pascual Abaj, where you may see shamans (Maya spiritual leaders) performing rituals, and visit the cemetery on the outskirts of town, where the mausoleums are painted in vivid colours. 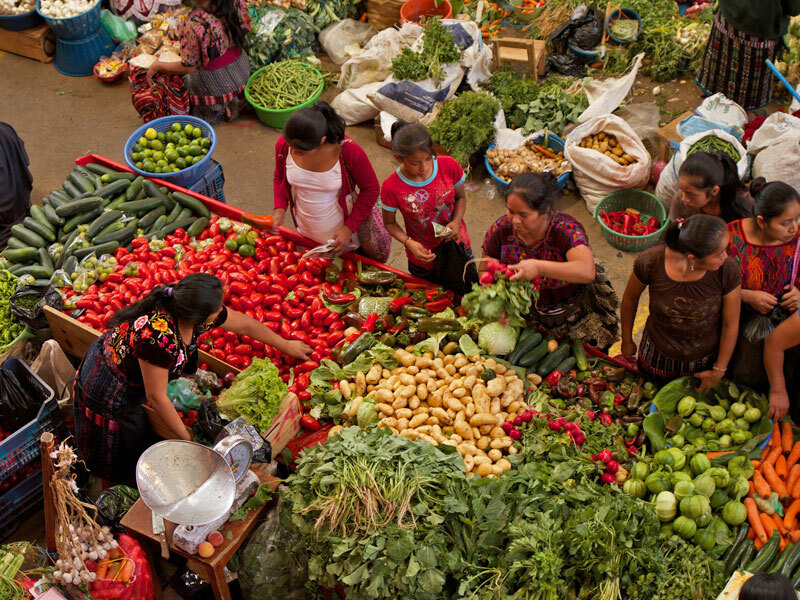 Your Guatemala adventures would be incomplete without a market visit, but when you go “beyond the market,” you’ll leave Chichi with a far deeper understanding of the community’s rich Maya heritage, its thriving indigenous culture, and its wonderful people.